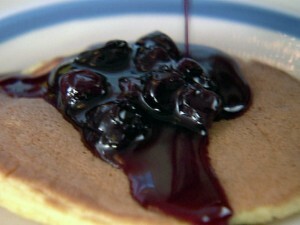 Put 1 cup of blueberries (fresh or frozen) and 1/2 cup of maple syrup in a saucepan over medium-low heat. Simmer for 2 minutes until warmed through. Awesome over pancakes, ice cream or whatever you desire. This entry was posted in Breakfast, Dessert by Modern Mom Meals. Bookmark the permalink.